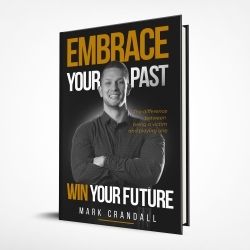 Austin, TX, April 11, 2019 --(PR.com)-- June 22, 2019 heralds Mark Crandall’s 2nd release: his highly anticipated and already #1 bestselling empowerment book, "Embrace Your Past, Win Your Future." Have you ever blamed a situation on past trauma? Have you ever felt you could not escape your negative thoughts? Do you believe or have you been told you lack motivation? Do you struggle with self-judgment? If you answered “Yes” to any of these questions, then this book is a must-read! "Embrace Your Past, Win Your Future" will guide any reader past mental blocks and limiting beliefs preventing them from living the lives of their dreams. In Part I, you will be guided through Mark’s story and connected to your own limiting beliefs and negative internal dialogue. You cannot create lasting change until you connect to your own pain. Mark uses his story of childhood trauma, drug addiction, homelessness, and incarceration to connect you to the internal dialogue that is preventing you - and most of society - from living the life of your dreams. In Part II of "Embrace Your Past, Win Your Future," Mark guides the reader through a series of introspective exercises to empower you to begin to view your past as a resource rather than a hindrance. This mindset shift will revolutionize your life and empower you to believe in yourself ... and fulfill everything in life that you desire. Advanced Praise: #1 Bestseller on Amazon in 24 hours of pre-sale of Kindle. About the Author: Mark Crandall, LMSW, LCDC, is a therapist, transformational life and business coach, workshop facilitator, keynote speaker, author of "Embrace Your Past, Win Your Future," and the host of Purpose Chasers Podcast. Mark went from a lost boy with countless traumatic experiences to drug addiction, prison, and an undying self-hatred to building multiple six-figure coaching practices and leading life-changing workshops where he empowers others to break free from their limiting beliefs toward creating the lives of their dreams.